Start the thread and tie a generous bunch of marbou onto the hook opposite the barb and wrap the thead down to part way round the the bend and take the thread back to 1/3 the shank length from the eye. 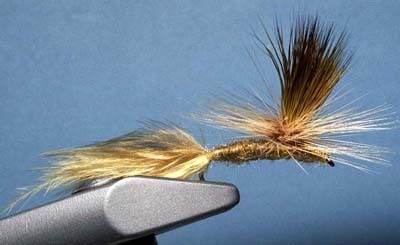 Stack a bunch of deer hair for a wing and tie it on top of the shank, taking care that the bunch of hair does not rotate round the shank. 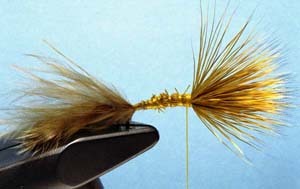 Stand the wing up, take the thread back to the tail and dub it with golden antron and wrap the body. 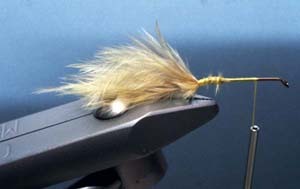 At the base of the wing, tie in two full length ginger hackles and wrap them parachute style to form a good support to float the fly on as shown in the picture at the top. Whip finish and you are done. In use, put floatant only in the wing and hackles. 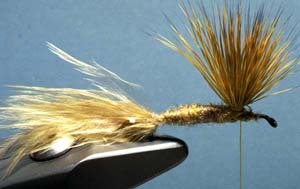 The marabou is meant to get wet and hang down representing the shuck of the emerging mayfly.